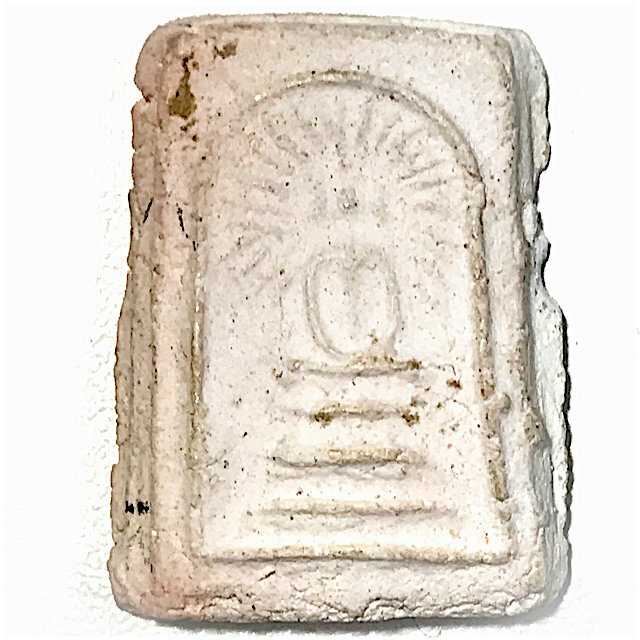 The Pra Somdej Rasamee Nuea Pong Puttakun Om Chompoo is made from 5 x 108 white Yantra inscription powders, but is a Pim Niyom most preferred model for the pink coloured Kraap Kru residue which appears on the surface of the amulet. This is hence the most highly preferred and sought after Pim Niyom category amulet from the Legendary Monk of Wat Pak Klong Makham Tao, Luang Phu Sukh .The amulets were made around the year 2460 BE, which included Pra Somdej and some Pra Pid Ta amulets, and some Rian Lor metallic votive tablets. The amulets are proven and historically documented as having been blessed by the two great Masters of Olden days, Luang Phu Sukh, of Wat Pak Klong Makham Tao, and Luang Por Parn, of Wat Bang Nom Kho. 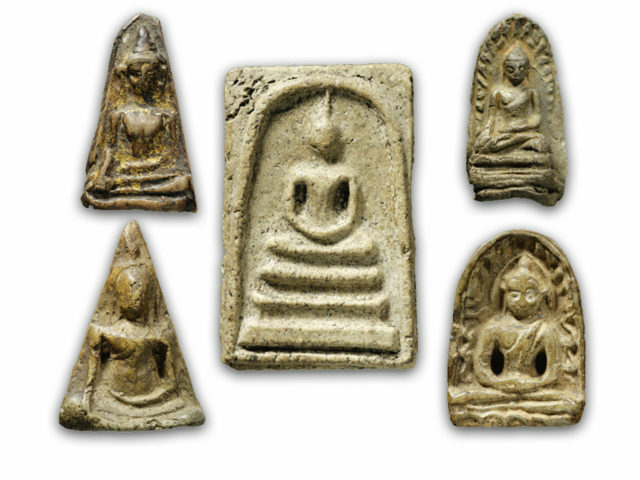 It was Luang Phu Sukh who ordered them to be hidden in the Wat Klong Khom Kru Burial Chamber of the Chedi Stupa, where they remained until their recent discovery some years ago. The Pra Somdej Rasamee was made in Granular Pong Bai Lan (black color), and Creamy Pong Puttakun (white color). There are also a very few rare examples where the Pong Puttakun turned a shade of pink on the surface (Nuea Pong Puttakun Om Chompoo), which are the most highly preferred of all. In truth there were many different block presses used to make the whole batch, which results in a large variation in the small details of each block press. This model has a double edge rim which is also a feature of Pim Niyom models. 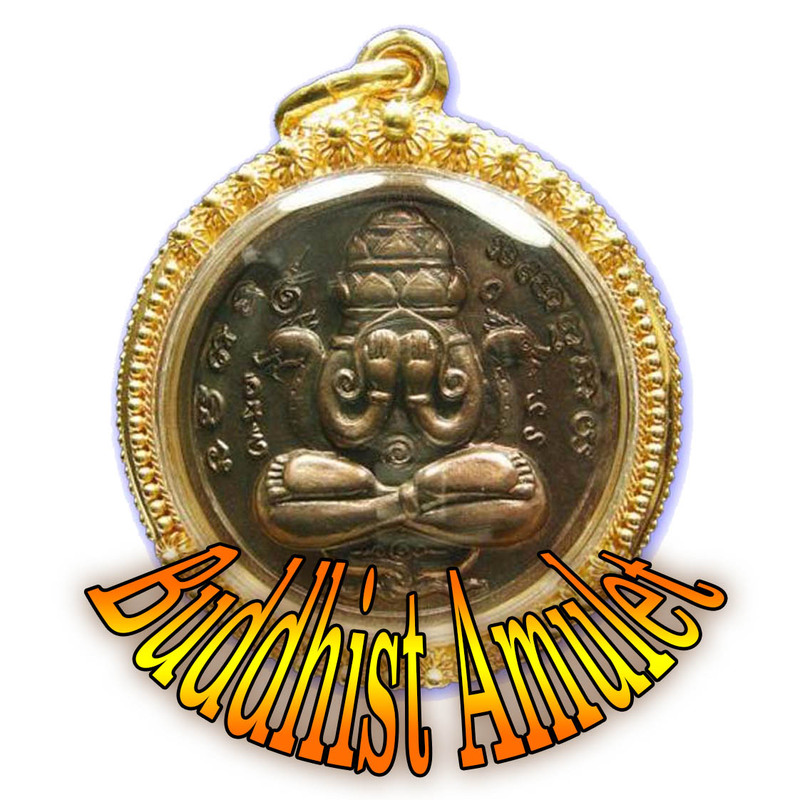 This amulet is officially recognized in the collector and antique marketplaces. The amulets were made in three different substances,; Nuea Pong Bai Lan (black parchment grimoire soot powders), Nuea Pong Puttakun (white Yantra powders), and Nuea Awk Chompoo Gae Sabu Luead (White with PInkish stains). The Pra Somdej Kru Klong Khom amulet series has already seen a few attempts to make fake copies, which have all failed till now because they do not look anything like the original. Their cement is nowhere near as hard or dry as the real thing. This example is both beautiful and without defects. Can be entered into competition easily without shame. This exhibit is from the upper section of the Kru Chamber which was less subjected to water floods and hence has much less Kraap Kru mildew residues on the surface, revealing clear detailed features.